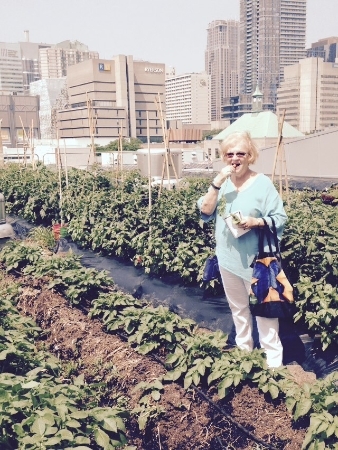 Arlene, Agriculture Coordinator for Ryerson University’s rooftop urban farm, is the recipient of this year’s Toronto Botanical Garden’s Rising Star Aster Award. 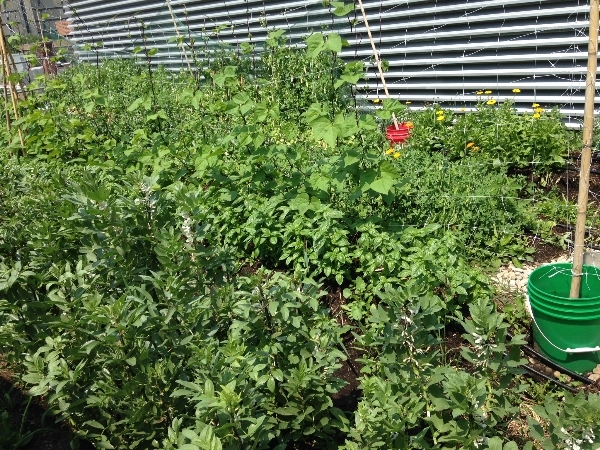 With the help of students, staff and faculty, Arlene has created an urban farm with more than 30 different crops and over 100 varieties. The team, known as Rye’s HomeGrown actually maintains six edible gardens on campus. 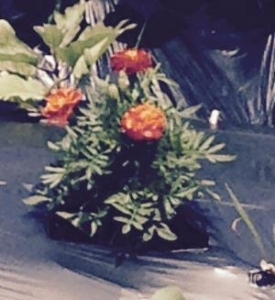 The project began as a student initiative and Arlene was hired to design the gardens. The rooftop plot is literally the hidden jewel in the crown. Arlene will be honoured at the Third Annual Aster Awards on Nov. 19 along with Canadian Astronaut Roberta Bondar and Evergreen founder and CEO Geoff Cape. Arlene has been chosen for her commitment and achievements in urban farming. There are beets, carrots, cucumbers, eggplants, kale, lettuce, onions, potatoes, strawberries, winter squash, tomatoes, zucchini and more in the garden. 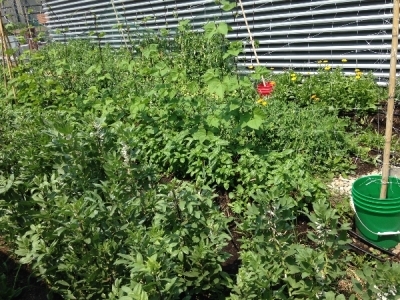 Borage and flowers such as calendula and marigolds have been planted to attract pollinators and they must be working because there are lots of bees and butterflies buzzing and fluttering around some six stories above the ground. “Yes, we’re getting five to 10 potatoes per plant,” says Arlene. It’s usual to get only about four to a plant. Winter squash and zucchini are larger than in Ryerson’s other, ground level gardens. Arlene says that’s because it’s so hot up on the roof plus the soil has actually been up there for 10 years. 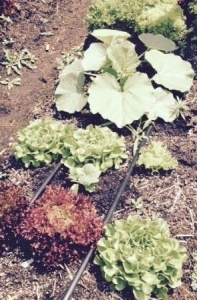 Arlene and her crew compost everything from the site including all kinds of weeds and they have built beds into that compost where they grow cucumbers and other cucurbits in unfertilized compost. 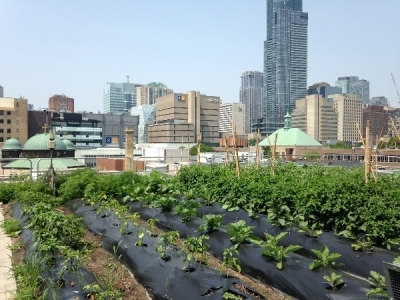 Harvest from the rooftop farm is used in Ryerson’s campus kitchens, sold at the weekly Gould St. Farmers’ Market and distributed to individuals who pay into the project and get baskets of fresh produce all season long. Ryerson’s rooftop garden is a hands-on way to teach students about the sustainability of urban agriculture and how to grow food. “The roof is a learning ground,” says Arlene who hails from Vancouver, studied at Concordia University in Montreal and has worked in farms, kitchens and greenhouses across Canada. Traditional green roofs reduce energy consumption by keeping buildings cooler in the summer and warmer in winter and they absorb rainwater instead of sending it into the sewer system. 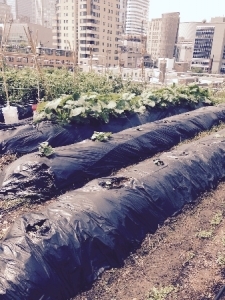 Roof top agriculture adds local food security to the existing benefits of green roofs. 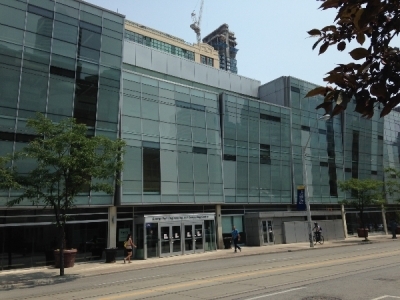 A Toronto bylaw passed in 2009 states that all new buildings more than six stories high must have a green roof. 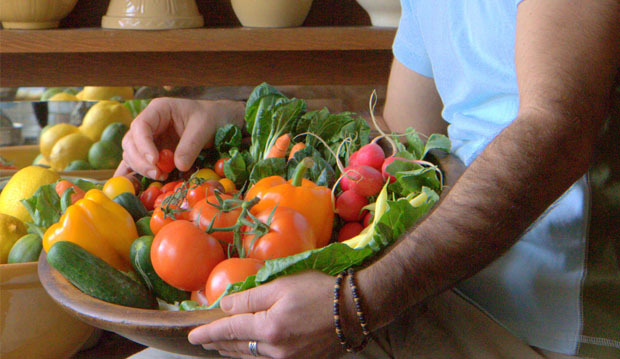 Pioneers cleared the land to grow crops to put food on the table. In more modern times, we enjoy the fruits of a multicultural buffet….